Co. Antrim: Ballyscolly, Derryaghy, Glenavy, Island Kelly, Knocknadona, Legatirriff, Lisburn (3), Lissue, Magheragall, Magheramesk, Malone, Tullyrusk. Co. Down: Annahill, Ballykeel, Ballymacbrennan, Ballyworfy, Blaris, Breda, Dromara, Drumbeg, Drumbo, Glasdrummin, Hillsborough, Killany, Maze, Ouley, Saintfield. The Board also included 9 ex officio Guardians, making a total of 38. The Guardians met each week on Tuesday at noon. The population falling within the Union at the 1831 census had been 71,308 with divisions ranging in size from Magheragall (population 1,182) to Lisburn itself (5,745). 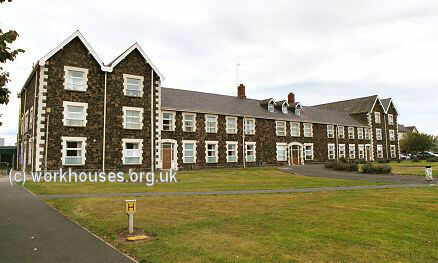 The new workhouse, built in 1841, was designed by George Wilkinson. It occupied a six-acre site on Hillsborough Road to the south of Lisburn and could accommodate 800 inmates. The cost of the building was £6,200 plus £1,358 for fixtures and fittings etc. It was declared fit for the admission of paupers on 1st January 1842, and admitted its first inmates a few weeks later on the 11th February. The site location and layout are shown on the 1904 map below. The buildings followed Wilkinson's typical layout. 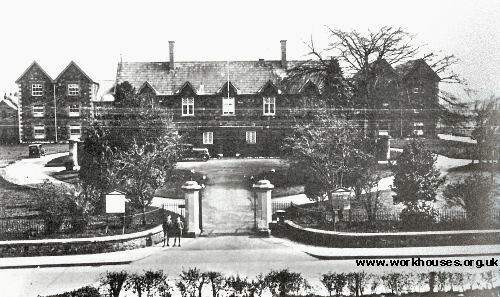 An entrance and administrative block at the west, now demolished, contained a porter's room and waiting room at the centre with the Guardians' board room on the first floor above. It was later extended at the north with the addition of children's school-rooms and dormitories. Lisburn main block from the north-west, 2003. At the rear, a range of single-storey utility rooms such as bakehouse and washhouse connected to the infirmary and idiots' wards via a central spine containing the chapel and dining-hall which, unusually, later had a second storey added. Lisburn main block, chapel and infirmary from the south, 2003. Lisburn main block and infirmary from the south-east, 2003. During the famine in the mid-1840s, sleeping galleries were erected to accommodate an additional 100 inmates, with a further 60 in a converted coal store. A house was hired as a temporary fever hospital prior to 60-bed fever hospital being erected at the east of the workhouse. A graveyard lay just to its north. Lisburn fever hospital from the south-west, 2003. At the 1901 census, the population of the Union was 46,463 with 10 officials and 223 inmates in the workhouse. In 1895, Lisburn was visited by a "commission" from the British Medical Journal investigating conditions in Irish workhouse infirmaries. Their report listed a number of deficiencies including cramped wards, and poor ventilation and heating. Further details are available in the full report. 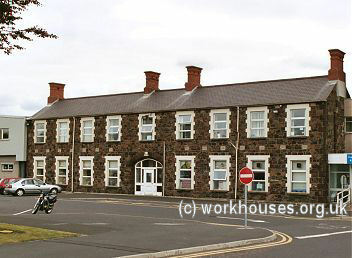 In 1921, the workhouse was closed and converted for use as the Lisburn and Hillsborough District Hospital, then later Lagan Valley Hospital. Public Record Office of Northern Ireland, 2 Titanic Boulevard, Titanic Quarter, Belfast BT3 9HQ. Holdings include: Guardians' minutes (Feb 1839- Sep 1948); etc.